1. Lightly coat an ice cube tray or a candy mold with cooking oil. 2. Place A in a blender / mixer and process until smooth. 3. Put B in a small bowl. 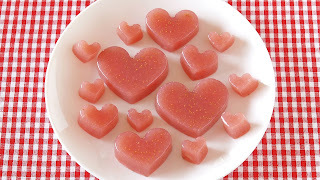 Place it over a bowl of hot water and stir until gelatin dissolves. *You can microwave for 30 seconds or so to dissolve the gelatin. continue stirring until gelatin completely dissolves. 5. Pour into the prepared tray and put in the fridge for about 30 minutes until completely set. If you want to use fruit juice, heat 240ml fruit juice. Then mix 4 tbsp. sugar and 30g gelatin.